The 2017 Mercedes E-Class Coupe is set to be introduced in January, at the Detroit Auto Show. But there is no need to wait until next year. Still in the intensive testing stage, the prototype of the coupe runs the snow-covered Austrian roads. The editors of Autocar had the chance to test the 2017 Mercedes E-Class Coupe and – from the passenger’s seat, whatever the question, the answer is “YES”. Is the 2017 model better than the 6-year old variant that it replaces? At an altitude of 2500 meters, along the roads of the Austrian Alps, they are riding the E400, powered by the 3-liter V6, mated with the 9-speed automatic transmission and the 4Matic 4-wheel drive. The E400 runs smoothly arrowing forward with no hesitation, whisper-quietly and effortlessly, at speeds that most drivers would likely never experience. Behind the wheel, proudly took a seat Peter Kolb, the man who has been supervising the testing and development procedures. He is the one pushing the luxury 2-door E to its limits. And those are quite hard to reach, as the model should hit a top speed of 155 mph (250 km/h) and it should need 5 seconds to go from 0 to 62 mph (100 km/h). Kolb discloses inside information, saying that the entry level variant, the E200, shall be fitted with a 6-speed manual transmission, while all others go for the 9-speed G-Tronic. What is the new Mercedes E-Class Coupe about? It has come a long way in terms of performance and economy, but also handling. The development team has also worked to provide an upgraded Dynamic Select system, with four different driving modes: Eco, Comfort, Sport and Sport Plus. Even though the driving position is 15 mm lower than in the sedan, the coupe soaks up the worst bumps of the road. It is the sensational comfort guaranteed by the comfort oriented set up of the suspension with Air Body Control. The 18-inch wheels with Michelin Pilot Alpin tires amplify the serene comfort. How does it look? 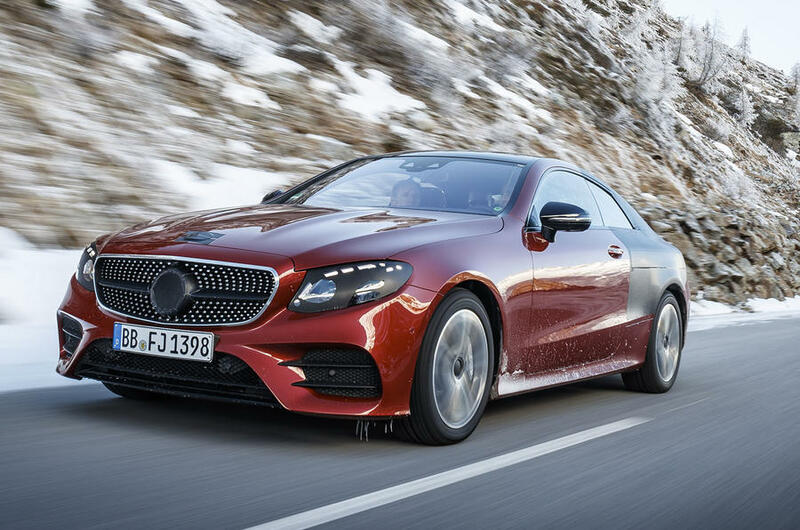 The camouflage and the icycles hanging from the front grille leave little to imagination, revealing that the new model follows the Mercedes coupe specific lines. The strips only cover the predictable headlights design, the rear wing, the layout of the elongated taillights and the sides of the rear spoiler. Like its predecessor, the new E-Class Coupe will be manufactured in the Mercedes-Benz plant in Bremen, Germany. The luxury coupe will be followed shortly by the cabriolet model, set to make its public debut next March, at the Geneva motor show.